They voted yesterday at 5,579 polling stations within 2,608 polling places, from the cities to the highlands to the islands. They lined up at dawn; voted all day; queued into the night. They turned out to vote in historic fashion, 84.6% of registered voters embracing their democratic moment. They participated in higher numbers than any previous vote in Scotland (80.9%) or the U.K. as a whole (84.0%). They voted, in the end, to retain their union with Wales, Northern Ireland, and England. The Union Jack will not lose its Scottish blue. 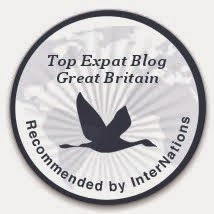 The United Kingdom continues. Intact. Although it wavered and equivocated in the polls, Scotland's final decision was decisive: 55% rejected independence. In a land which reveres William Wallace and Robert the Bruce, which romantically refers to Bonnie Prince Charlie's rebellion in '45 as though it were in living memory and not from 1745, only 45% of Scots voted in favor of cutting ties with the auld enemy. YES garnered 1,617,989 votes. But another 2,001,926 Scots pondered independence and decided NO, we don't want to create a new country. It was a once in a generation, perhaps once in a lifetime, offer of disunion from their fellow Brits. And a majority decided the anti-independence campaigners were right, we're Better Together. A few thousand Scots took their paper with its one question and, possibly overwhelmed by the magnitude of the moment, failed to return a countable ballot. These "rejected papers" included 2,554 ballots left unmarked or void for uncertain marks; 691 ballots that marked both YES and NO; and 16 ballots which left some unacceptable mark. A final 168 voters in some way marked their ballot but were disallowed because they wrote their name or some other identifiable information -- an odd choice by a voter, but an even odder reason for rejecting an otherwise valid ballot, unless we say "stand up to be counted, but don't let us know who you are." 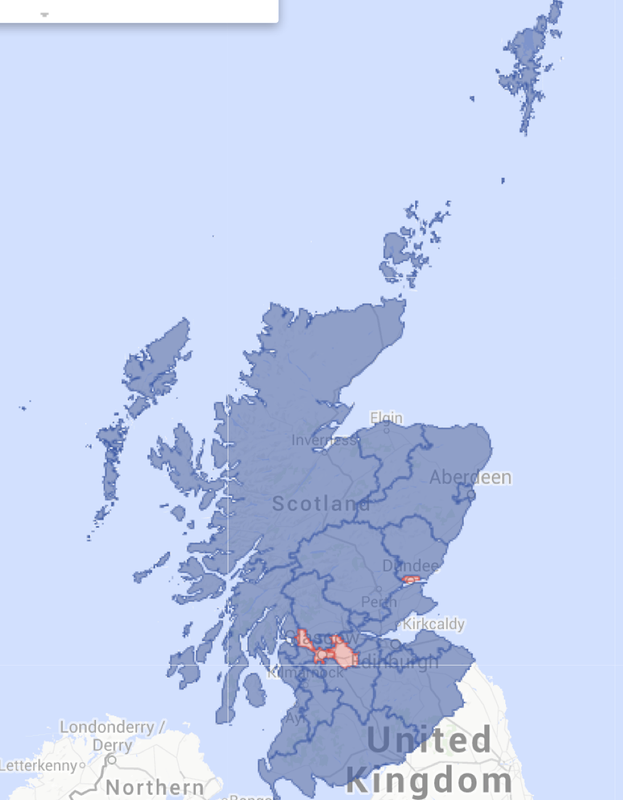 Of the 32 voting precincts in Scotland, only four supported independence. That included Glasgow, the largest precinct with 12 percent of Scotland's total population, at 53.49% for YES. The city's turnout, however, also was the lowest of any precinct, reaching merely 75%. The purple-shaded areas voted NO to independence; areas shaded red voted YES. But though it has not been dismembered, the United Kingdom is less united than ever. And it's poised for less unity going forward. As part of their wooing during the referendum campaign, the three major U.K. parties -- Tories, Liberal Democrats, and Labour -- all pledged major devolutionary powers to Scotland's parliament. As soon as possible. Each party has its own proposal, but the differences are largely of degree and not of type. Scotland, which has always retained its own legal system, will get increased power over taxation and more power over social spending. The U.K.'s parliament likely will retain full control over issues such as defense, foreign affairs, energy, immigration, pensions, and a few other areas. All other matters -- education, housing, welfare, transportation, income taxes, and so on -- will be either wholly or substantially controlled by the Scottish parliament. Ironically, it was the Scottish National Party and its leader, Alex Salmond, who pushed for these kinds of "devo-max" powers to be included as a third option on the independence referendum ballot. The SNP asked to have the ballot include options for YES, for NO, and for greater devolution. The parties at Westminster rejected the option for devolution, only to use promises for such devolution as a carrot (i.e., bribe) when the campaign got closely contested. This evening, Salmond announced he will step down both as Scotland's First Minister and the head of the SNP this coming November after the SNP holds its party conference. He has led the SNP for a total of 20 years (not all consecutively), and has been Scotland's longest-serving First Minister. This morning, basking in the glow of victory, Prime Minister David Cameron reiterated his commitment to devolution. He set out a timetable for a devolution "white paper" to be produced by this November, and draft legislation for Parliament by January 2015. Somehow, he expects all the parties to work cooperatively on the matter, even though they're all positioning themselves for the May 2015 general election. While all three major parties have pledged devolution post haste, they have incentives and disincentives to working together. Scotland will ignite with anger if the Westminster parties fail to provide what they have promised. A fair number of NO voters rejected independence only because of the promise of further devolution. I think it's a safe bet that some significant devolution will be secured for Scotland in the relatively near future. But Cameron also added new wrinkles to the game today. He pledged further devolution for Wales and Northern Ireland, not just Scotland. And, significantly, he said the so-called "West Lothian question" should be decided at the same time and in conjunction with the devolution to Scotland, Wales, and Northern Ireland. It's important to remember that while Scotland, Wales, and Northern Ireland have devolved governments that limit what the U.K.'s parliament can decide, England has no corresponding parliament. The U.K.'s parliament decides all English matters. The "West Lothian question," first raised in 1977 by a Member of Parliament from the West Lothian constituency in Scotland, asks whether Scottish MPs (or Welsh or Northern Irish) should be allowed to vote on matters affecting only England. In a devolved United Kingdom, the Scottish and Welsh and Northern Irish MPs can vote on all matters in the U.K.'s Parliament, including all matters affecting only England. But English MPs do not have an equivalent vote on matters controlled by devolved Scottish, Welsh, or Northern Irish parliaments. Cameron wants to solve the West Lothian question, most likely by allowing only English MPs to vote on matters that affect only England. That would mean Scottish, Welsh, and Northern Irish MPs would not have equal rights as MPs as their English counterparts. Not only would those Scottish, Welsh, and Northern Irish MPs have no vote in their own devolved parliaments, at the same time they would have fewer votes to cast in the U.K.'s parliament. Furthermore, if a party -- most likely Labour -- gained a majority of seats in the U.K. parliament, it might lose its voting majority if the chunk of Scottish, Welsh, and Northern Irish MPs were not allowed to vote on matters. Currently and likely for the near-term, Labour has no chance at a majority in the U.K. parliament without those MPs, particularly without the consistent Labour bloc from Scotland. Cameron's suggestion to solve the West Lothian question on the eve of the May 2015 general election is a superb political machination. As the leader of the Tories, he positions himself as the champion of the English voters, who are far and away the majority of the U.K.'s population. It puts Labour in an awkward position. If they accede to Cameron, they potentially lose the use of Scottish, Welsh, and Northern Irish MPs in votes in Parliament; even if they win the May 2015 election, their power could be diminished. If they oppose Cameron and anger English voters, they may lose the May 2015 election because of it. reflection and discussion rather than for prompt action. American Union and the great kingdoms and principalities and States of the German Empire. 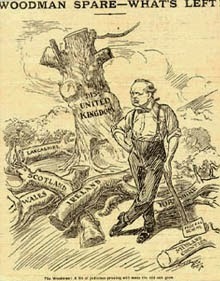 In 1912, Churchill had proposed 10 regional parliaments: one for Scotland; one for Wales; one for Northern Ireland; and seven for regions of England. By "parliaments," Churchill apparently had in mind something similar to U.S. states. He also pointed to the federal systems of Canada and Australia. A September 1912 political cartoon from the Liverpool Daily Courier. Yesterday, Scotland voted to reject independence and persist in the United Kingdom. In the next few years, as a result of its referendum debate, Scotland may witness the other constituent nations of the U.K. ease into a loose federation that only nominally remains united.